Today is the first day of Fall. The mornings are becoming chilly here in Virginia. It’s that time of year that the days are sunny and dry. Summer vegetables are beginning to wane. Apples are ripening on the trees. Acorns are falling to the ground. The leaves on the trees are beginning to change from green to bright fall colors. And it’s time to make my Favorite Fall Dishes. 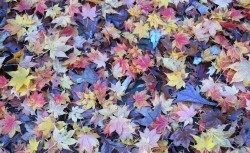 Fall, or Autumn, is the favorite season for many. What are the alluring fragrances of Fall? Cinnamon, nutmeg, mulled ciders, baked apple and pumpkin pies, cool crisp air and even burning leaves. For me, Fall means simmering soups and stews on the stove, luscious pies baking in the oven, sweet and savory salads made with Fall fruits and vegetables, and braised and roasted meats. 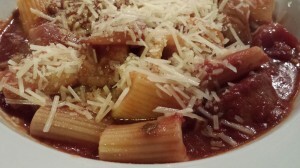 Here’s a compilation of some of my recipes that “fall” right into the cooler weather. 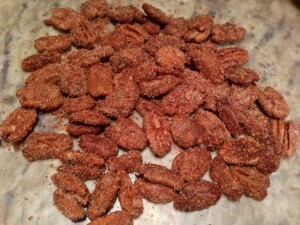 Cinnamon Pecans are a simple snack that can start your Happy Hour or hang around to be nibbled during the day. 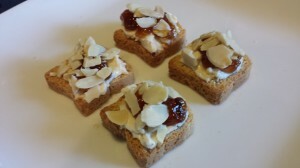 My Fig Almond Cheese Nibbles are elegant and so easy to make, your guests will be impressed. Fresh figs are a favorite fall fruit, as are dried figs. 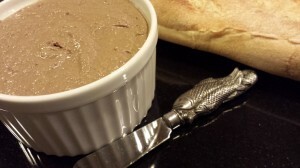 Hubby’s Chicken Liver Pate is a sumptuous treat at our house, usually enjoyed during the fall and winter months. 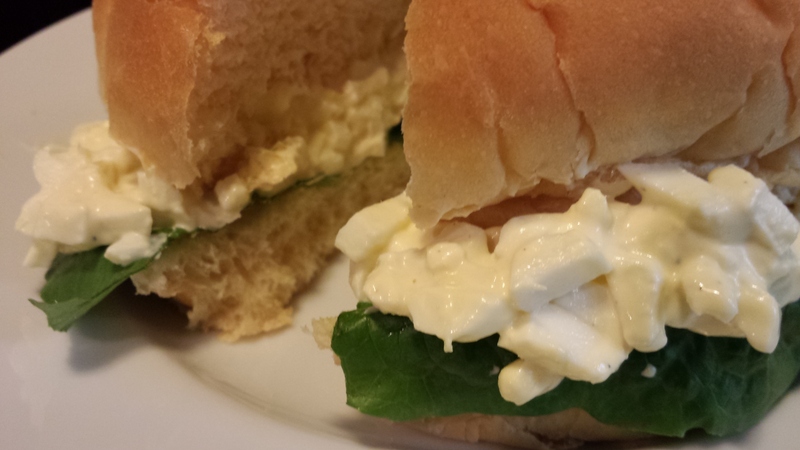 Inexpensive to make, be sure to whip up a large batch. Freezes well, too. 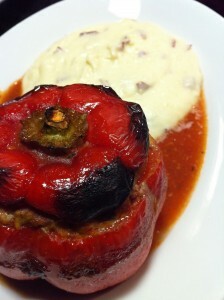 Last winter, I came up with this savory and slightly sweet appetizer for chilly evenings. 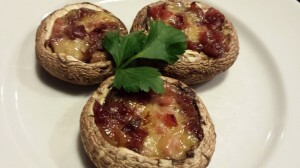 Stuffed Mushroom Caps with Brie Ham and Dried Cranberries are a hit with friends and family. 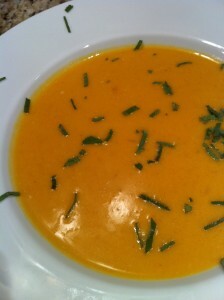 Velvety Butternut Squash Soup is a very elegant and easy dish for a dinner party or a casual Saturday lunch with friends. 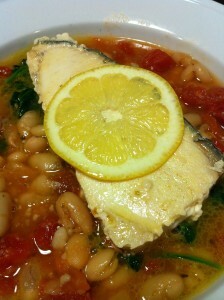 Top with some thinly sliced fresh sage leaves from your garden. 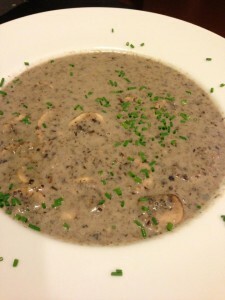 A favorite savory fall soup is my Wild Mushroom Soup with Sherry. Goes great with some crusty bread. 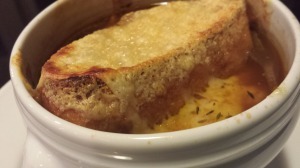 My Baked Onion Thyme Soup spends an additional few minutes in the oven to melt Swiss cheese over a toasty crouton. 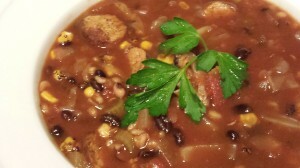 Not for the faint-hearted, my Spicy Bean Soup with Andouille Sausage adds a kick to your Fall dinner menu. 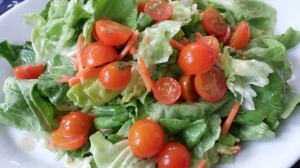 The Food Lover’s Special Bittersweet Salad features radicchio, celery, and carrots as some of the nice fall salad vegetables that are available in your grocer’s produce section. 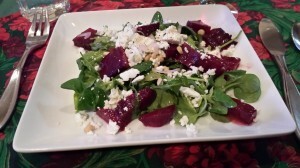 If you are a beet lover like I am, my Roasted Beet Salad with Goat Cheese and Pine Nuts is a gorgeous addition to your fall menu. 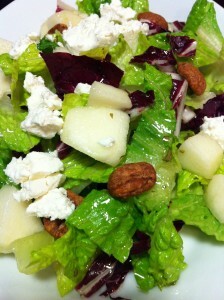 My Pretty Pear Salad with Goat Cheese and Cinnamon Pecans takes advantage of those luscious ripe pears that are arriving at farmers’ markets this time of year. 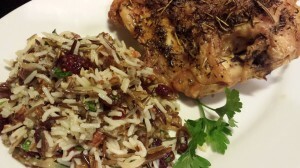 My Wild Rice Salad with Dried Cranberries and Apricots can be served hot or cold. I prefer it to be served chilled alongside sliced turkey breast or a grilled chicken breast. 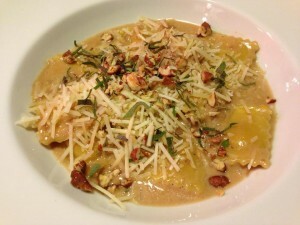 One of my absolute favorite fall pasta dishes is my Butternut Squash Ravioli in a Calvados Cream Sauce. 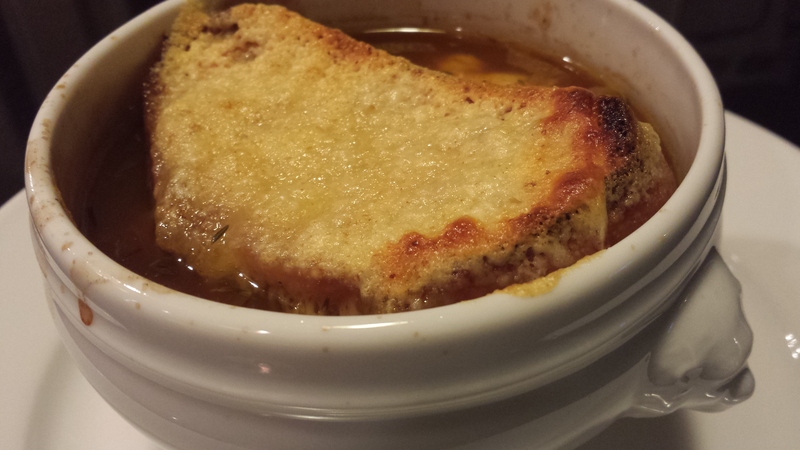 It features all of those favorite fall flavors including Calvados which is an apple brandy. 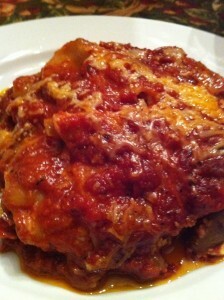 Another hearty pasta dish for the cooler evenings, my Sausage, Mushroom and Shallot Lasagna is rich with flavor. Pesto is a great way to use that final harvest of basil from your garden. 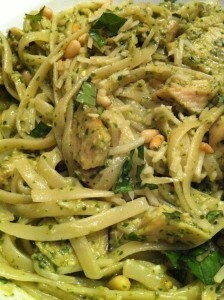 My Garlic Chicken Pesto Pasta features pesto. You can also buy premade pesto in your grocer’s refrigerated section. Chicken Rosemary Rigatoni is a simple weeknight dinner main course. Use fresh rosemary from your garden, or use dried for a similar result. A light and tasty fall dish, my Hearty Grilled Fish over White Bean Stew is just begging to be served with a big slice of garlic toast. Sauteed Scallops and Confetti Vegetables over Carrot Parsnip Puree offers a solution for “what to do with parsnips” and incorporates carrots in the base puree for some sweetness and color. 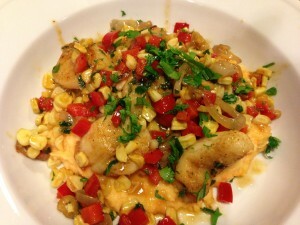 Scallops are a favorite dish at my house. 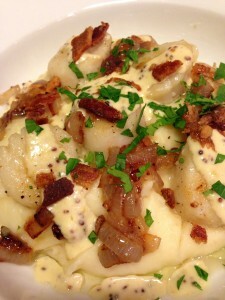 My Seared Scallops and Shallots over Mashed Potatoes with Grainy Mustard Sauce and Real Bacon Bits loudly proclaim that Fall is here to stay! 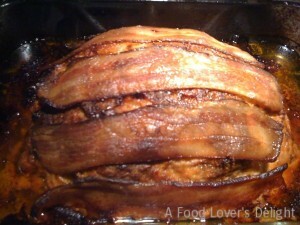 My Bacon-Topped Meatloaf also grew out of a recipe that originated in my mom’s recipe box. Leftover meatloaf can stuff sandwiches for a homey Fall lunch at work or school. Once in a while, we are able to get fresh venison at our local Whole Foods. 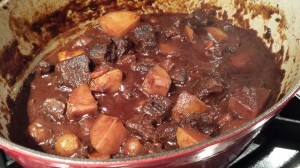 My Venison Stew is a fragrant, aromatic, rich way to use venison and root vegetables. You could use beef instead of venison with a similar result. 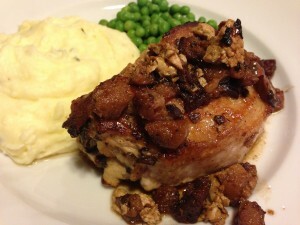 There’s nothing like my Stuffed Pork Chops to announce that Fall has arrived. Easy to make, and finished in the oven, my pork chops feature sage as a lovely fall herb. 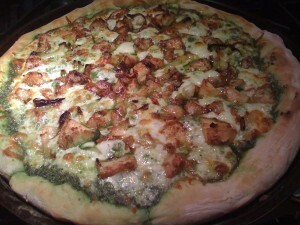 Chicken Pesto Pizza is another way to use that basil pesto. Try it for your usual Friday Night Pizza! Root vegetables, such as potatoes, can Fall-ify (is that a word?) your pizza! 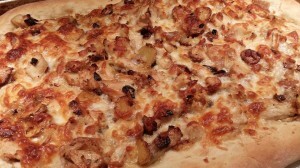 Try my Garlic Chicken Pizza with Fingerling Potatoes for a different type of pizza. For me, dates also signify Fall. 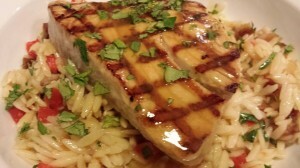 My Buttery Orzo Pasta with Dates, Shallots and Red Bell Pepper is a simple side dish that can accompany roasted chicken, seared pork chops, or a as a savory bed for piece of grilled salmon or tuna. What to do with all those tomatoes at the end of the season? 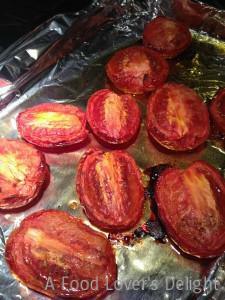 My Roasted Tomatoes are a great solutions that freeze well. There’s no better way to enjoy fall root vegetables than my Roasted Vegetables dish. Roast potatoes, beets, carrots, parsnips, turnips…you name it! Serve along with roasted meat for a hearty Sunday dinner. 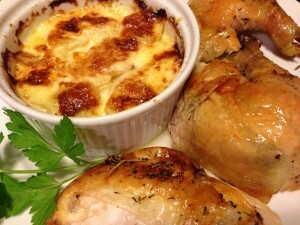 One of my favorite side dishes, although I don’t indulge in them often, are my Sinful Potatoes au Gratin. Super rich and creamy, these potatoes go well with a grilled steak or chicken or even as a main dish on their own. What’s more indicative of Fall than Truffles? Not everyone can afford fresh truffles. 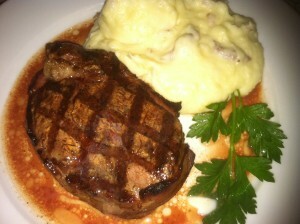 A simple addition to mashed potatoes is truffle oil. Try my Truffled Mashed Potatoes for an earthy Fall side dish. 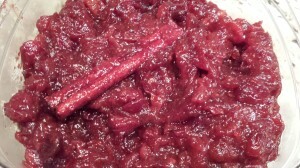 My Cranberry Compote with Cinnamon and Calvados goes well with a Thanksgiving meal. 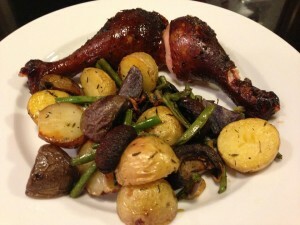 Also, I like to make it in the Fall to accompany roasted chicken or pork. 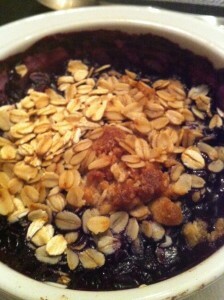 Very Berry Crumble is a homey Fall dish that’s easier to make than a from-scratch pie. Substitute apples or pears for the berries. And what to do with all that zucchini? 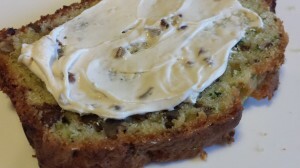 My Savory Zucchini Bread, slathered with butter or cream cheese (my favorite is Honey Nut cream cheese) or eaten plain, is versatile for breakfast or dessert. And it freezes well. 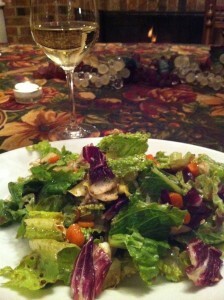 My favorite Fall salad dressing is my Roasted Walnut Oil Dressing. 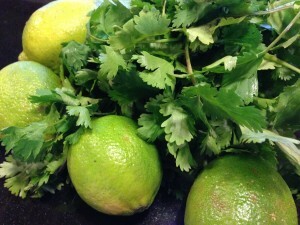 Try it on baby greens, or alongside crudites for dipping. 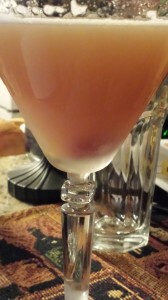 Last Fall, my husband created his Autumn Cherry Pie Cocktail for me. It tastes just like a cherry pie! I hope that these recipes taste like Fall to you! Let me know what you think.